The Benzie County Republican Party’s newly elected Executive Committee and friends held their first meeting of the 2019-20 election cycle at 6:30 pm on January 15th at Benzonia Township Hall. After routine business, newly elected GOP Chairman Art Jeannot announced that standing committees now include a Legislative Committee to report on activities of the Michigan Legislature and other governmental bodies. Charles Mayer agreed to chair that committee, discussed his plans and passed out contact information for members to reach him. Jeannette Feeheley, GOP Vice Chair, agreed to take on the task of both internal and external communications while Secretary Maureen Jeannot will handle distribution. 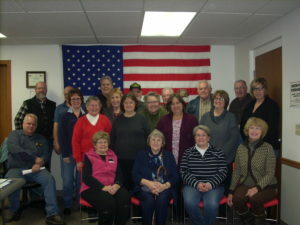 Treasurer Donna Clarke is upgrading the Treasurer’s Report, and Jan Mick reported that she has successfully recruited eight enthusiastic members to prepare for the party’s annual Lincoln Day Dinner to be held in May. Chairman Jeannot reported that further committees would be established on an ad hoc basis to handle specific matters. The Executive Committee voted to approve a change in the monthly meeting dates to the first Monday of each month to accommodate the ability of our state legislators and others to attend from time to time. A Call to County Convention to be held at 7 pm, Thursday, February 7, at Benzonia Township Hall has already been sent to all precinct delegates and GOP elected officials. The purpose of the County Convention is to select six delegates and six alternates to attend the Michigan Republican Party Convention in Lansing later in February. The next business meeting of the GOP Executive Committee will be held at 6:30 pm Monday, March 4th at Benzonia Township Hall, to be followed, if participants desire, by Open Round Table Discussion on matters of interest to the Party. All Republicans are invited to attend. Keep up with State Legislation. Chuck & Marian Mayer are following the current legislation. If you have a specific topic you'd like reported on at our monthly meeting, contact Chuck and Marian cmmayer8@gmail.com. "Michigan drivers currently pay the highest car insurance rates in the nation, and it’s the committee’s job to help find a way to fix it." They welcome your opinion on the Reduce Michigan Rates Now website. Proposal 2 information from the November 2018 ballot including the full proposal, the constitutional amendment, Q & A and how to apply to be a member of the citizen redistricting commission. Get involved! The Benzie County Republican Party believes that all lives are precious no matter the age. We believe that all Americans are entitled to life, liberty and the pursuit of happiness and this includes lives that are still in the womb. We will fight to protect all lives, especially those who cannot protect themselves, namely the unborn. Copyright © 2019 Benzie County Republicans. All Rights Reserved.